Computational design and robotic labour are ever too often perceived as completely autonomous processes, whereas we believe the engagement of people is key in improving society. The human-in-the-loop during design, manufacturing and use will be the main focus in this lab, co-founded by MX3D, the Amsterdam Institute of Advanced Metropolitan Solutions (AMS Institute) and TU Delft. Located on the MX3D premises in Amsterdam, the aim of the 3D Building Fieldlab is to accumulate and experiment with digital fabrication and robotics for the built environment, with a particular focus on human-centered design. To face this, we also need to address key challenges in robotics, 3D modelling, and metallurgic engineering. This research is framed in a novel interdisciplinary format in which designers, engineers, and scientists jointly develop & test solutions. As such, the 3D Building Fieldlab is indeed bridging scientific knowledge with the ambitious challenges that are expressed by MX3D. MX3D will host student groups, ranging from academic institutes to vocational schools. A permanent Embedded Scientist will focus on the academic agenda in line with the production process of MX3D. The FieldLab’s Principal Investigator will make an effort to include knowledge from relevant research projects. Novel design principles through robotics & 3D modelling, to be compiled in a digital design repository. Development and testing of agile, iterative development methods (as opposed to the traditional product development processes). The results of this will be presented during a symposium, planned in the second half of 2016. Life cycle analysis and benchmarking methods of Wire & Arc Additive Manufacturing, to be published in scientific articles. At the MX3D facility in Amsterdam a student team from TU Delft has developed a fully functional 3D printed stainless steel bicycle. The students designed the frame of the bicycle to demonstrate the potential of the MX3D method for 3D printing metal. The students achieved the goal of their three-month project by printing the bicycle frame in collaboration with our MX3D engineers in Amsterdam. The bicycle was designed as part of a research project at the AMS Building Fieldlab into the viability of WAAM, Wire Arc Additive Manufacturing, a 3D printing technique based on MIG welding. The AMS Building Fieldlab is a collaboration between MX3D, TU Delft and AMS / Amsterdam Institute for Advanced Metropolitan Solutions. The collaboration focuses on the wider impact of WAAM in the city environment. In a video about the production of the bicycle, the students prove the frame’s strength by riding it around the city of Delft. Demonstrating that it can really be used in real world conditions. It performs well on the often bumpy cobblestone streets of the city. The project was realized in collaboration with MX3D, an R&D start up in Amsterdam, who specializes in Robotic Additive Manufacturing. The company has developed a ground breaking method for using multi axis robotic arms as 3D printers. This allows metals and resins to be printed mid-air in any direction without the need for support structures. The company made world news last year when it released plans to 3D print a steel pedestrian bridge in Amsterdam. Through the 3D Building FieldLab, MX3D invited the students to studie and experiment with the many aspects of this innovative digital fabrication technology. Q: Can you tell us a little more about the printing process? A: The printing process used to produce the frame is known as Wire and Arc Additive Manufacturing (WAAM). The method allows for multi axis 3d printing, using articulated robot arms because of the self supporting nature of the material. It also allows you to print larger objects than other types of 3D metal printing. Q: Is the bicycle heavy? A: This prototype weighs about the same as a normal steel bicycle. It can be optimized a lot more. However our main concern when designing the frame was the strength. We didn’t know how the material would behave, so we chose to make it extra strong and sacrifice a bit of lightness. Q: How does it ride? A: We tested the bicycle on the streets of delft and it performed well. It offers quite a smooth ride. The wheel base and the low centre of gravity of the bicycle make it easy to take fast turns. It has a fixed gear configuration which was the most elegant solution for us as its primarily a concept bicycle. Jouke Verlinden, PhD, principal investigator of the 3d Building Fieldlab & Researcher on Human-Centered Digital Fabrication at the Faculty of Industrial Design Engineering, TU Delft. The project was conducted at the 3D Building Field Lab, a collaboration of MX3D, TU Delft and Amsterdam Institute of Advanced Metropolitan Solutions (AMS). Special Thanks to the MX3D team and STV Welding Supplies for all the time and resources that went into creating the bicycle. If you have a particular question regarding the science behind MX3D, or would like to collaborate, or participate in a student project please send us a note. Jouke Verlinden, assistant professor Augmented Matter in Context, Faculty of Industrial Design Engineering at TU Delft, Research associate of the Delft Robotics Institute and project leader at AMS Institute. Amsterdam is the Living Lab for AMS Institute, a new ambitious scientific institute where science, education, government, business partners, and societal organizations are working tightly together to create solutions for the complex challenges a metropolitan region like Amsterdam is facing. 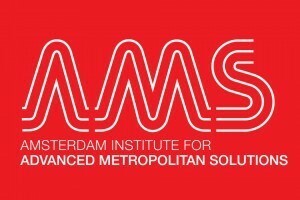 AMS Institute is anchored in the unique cooperation and commitment of three prominent universities in the field of applied sciences: TU Delft, Wageningen UR and MIT. TU Delft is a Dutch university of technology with over 17,000 students and 2,500 academic staff. In the 2012-2013 Times Higher Education ranking, TU Delft ranked among the top 40 worldwide in engineering and technology, and among the top 100 worldwide overall. The university explicitly aims at developing solutions for societal problems, creating value for the economy, and improving the quality of life of citizens. TU Delft is one of the main education centers behind the internationally acclaimed Dutch tradition of urban design. While maintaining a wide range of research in engineering and design, it has defined specific focus areas on energy, environment, transport & mobility, and health.